It is amazing to me what color can do. The mood it can set. The reactions it can create. Gold as a color has come to represent prestige, wealth, and wisdom. When the color gold comes into view you can't miss it. To see it raining down in showers of richly hued flowers can be a truly stunning spectacle. You just want to bathe in all of its visual lusciousness. This is what I experience each time I see Cassia brewsteri in bloom. 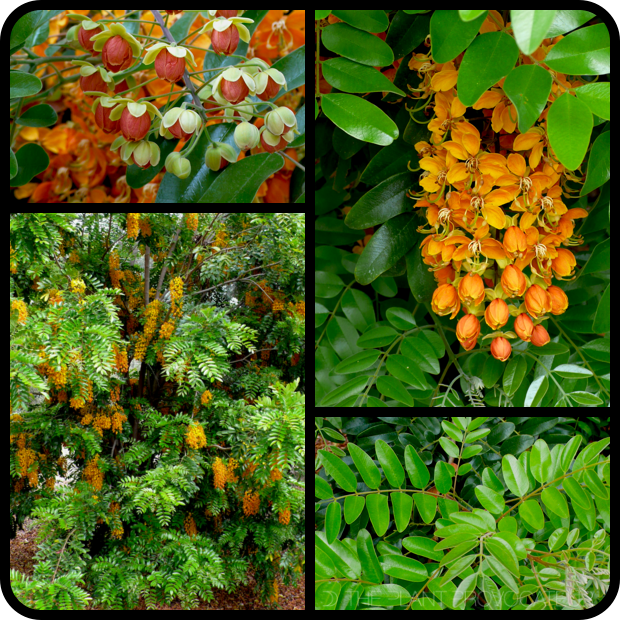 Cassia brewsteri, also commonly referred to as Leichardt's Bean, is a small evergreen tree from Queensland, Australia. It's one of those you-don't-see-it-too-often-gotta-have-it trees. It looks like a tree with the chic cascading floral form of Wisteria, combined with opulently pinnate glossy foliage, a handsome tree trunk furrowed in seductively dark grooves, and an overall branching pattern that looks hazy, draizy, dreamy from afar. During the seasons of fall through spring seeing Cassia brewsteri in bloom makes you feel so alive. Flower buds look like reddish-orange lanterns that then open up to reveal and deal a burst of golden yellow-orange petals. Flowers are arranged in pendulous grape-like racemes the color of deep honey. As added interest, cool cigar-shaped seed pods form after flowering. This is indeed a tree for a garden of earthly delights. Cassia brewsteri comes from wet, tropical areas in northeast Australia, but it does make itself at home beautifully in other tropical and subtropical climates. It can grow anywhere from 6 -25 feet tall and wide. It likes full sun to part sun conditions, well-draining soil that can hold some moisture, and regular watering until once established. Once established this tree becomes drought tolerant. It's also hardy down to 28 degrees fahrenheit/-2 degrees celsius tolerating light frost. Cassia brewsteri looks amazing both in the ground and as a small specimen in a container. It's definitely a 'feel good' plant. 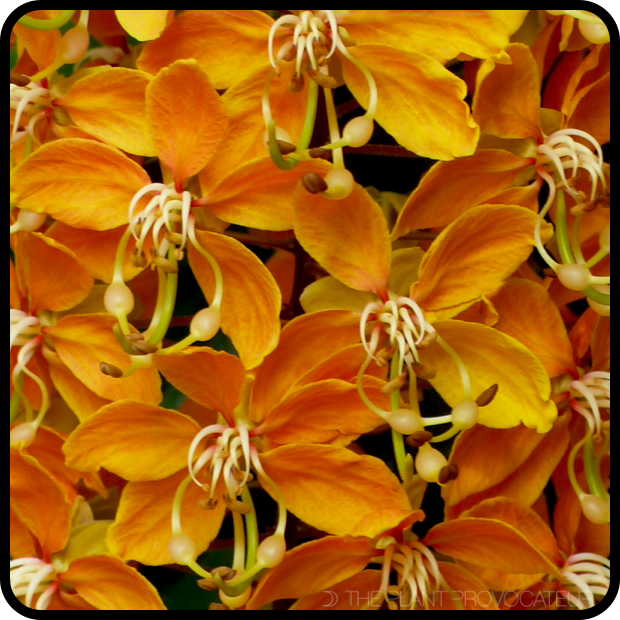 I'd suggest this plant for any subtropical situation that needs a golden glow or a luxurious lift.